As Military Appreciation month wraps up for May and we recognize Memorial Day, I wanted to recount an experience I had judging a hackathon for military veterans run by VetsinTech and hosted at Facebook. Reflecting on the entrepreneurs I heard pitch at this and other veteran events I’ve participated in as a venture capitalist and advisor, I noticed a strong difference in the companies founded by military veterans — veterans are much more likely than others to create a company with a founding mission of social good . It’s a perspective echoed by the executive director of VetsinTech, Katherine Webster. The question I wanted to answer was why these veterans were more likely to launch a company focused on social impact. To begin with, military veterans are much more likely to become entrepreneurs than others. A 2011 Small Business Administration (SBA) study concluded that “veterans are at least 45 percent more likely than those with no active-duty military experience to be self-employed,” and 13 percent of all small business owners are military veterans, according to research by Martin Bressler in the Academy of Entrepreneurship Journal. This is why one of the big ways that VetsinTech works with veterans to help them find jobs in the tech industry is through training, mentoring and networking to support the launch of their own business, with programs like the hackathon and VetCap (capital for veterans), which I co-founded with VetsinTech. We’ve noticed that many of these veteran entrepreneurs, far more than other founders by our experience, have an underlying mission driving their startup idea: they want to help other people in need. From the battlefield to the executive’s desk, veterans are coming back and choosing to launch businesses aimed at making people’s lives better, aiding the vulnerable, protecting us or conserving the environment. When I ask these founders why, I’ve heard three reasons. First, military veterans have some hard-core skills, from engineering to management, that they believe can be applied to non-military problems. Second, veterans often carry over a sense of service to others, and entrepreneurship with a social mission is a natural extension of that character quality. Finally, entrepreneurship is daunting and hard for everyone, especially if you chase giant social problems, so it’s not surprising that veterans who have had to develop the grit to do hard things are more likely to step up. Here are 12 great veteran entrepreneur examples, from budding ideas to successful businesses. There are many more impressive people out there, so send me ideas via Twitter or reply in the comments section below, and we’ll do a follow-up post. RUMI Spice — Kimberly Jung (CEO, co-founder; U.S. Army). RUMI Spice is a for-profit social enterprise that works with Afghan farmers to source some of the best, sustainably farmed saffron for international customers. By sourcing direct from the farmers and employing women to harvest the stigmas of the flowers, Rumi is revitalizing the local economy and empowering Afghan women. Tech billionaire and investor Mark Cuban just invested in RUMI Spice on Shark Tank. Elemental Path (Cognitoys ) — Donald Coolidge (CEO, co-founder; U.S. Marine Corps). Cognitoys is a smart, connected educational toy that uses IBM’s Watson AI technology to help kids develop intellectually as they grow. Cognitoys was listed as one of the top 25 inventions by TIME Magazine, and recently was mentioned as one of the top 8 revenue-producing new veteran startups by Mark Rockefeller of StreetShares. Bands for Arms — Nick Mendoza (founder, owner; U.S. Navy). Bands for Arms takes old donated military uniforms and makes them into wristbands to honor our fallen service members, and donates 50 percent of the sale price to military nonprofits helping active-duty service members and veterans. ID.me — Blake Hall (CEO, co-founder; U.S. Army). ID.me is a digital identity wallet that allows people to easily prove their identity online and get access to a range of offered benefits, from savings at retail stores to services from the U.S. Department of Veteran Affairs. ID.me has raised over $45 million in capital. Goodworld — John Gossart (COO, co-founder; U.S. Army). Goodworld provides an innovative tech platform for an easy way to make charitable donations right in Twitter or Facebook, just by using a #donate hashtag. People can donate to needs in real time, and charities get funds faster. RideScout — Joseph Kopser (CEO, co-founder; U.S. Army) and Craig Cummings (COO, co-founder; U.S. Army). RideScout was a mobile app to provide commuters with all possible transportation options and utilize predictive technology to help people get around smarter. RideScout was acquired by Daimler AG in 2014. Efflux Systems — Mike McNerney (CEO, co-Founder; U.S. Air Force). Efflux provides automated security operations software that can track movement on a company’s network and correlate it to attack threats in near real time. Ustream — Brad Hunstable (CEO, founder; U.S. Army). Brad developed Ustream while searching for a way for himself and others to communicate with loved ones at home. Ustream provides live social video streaming technology and was acquired by IBM in 2016 for $130 million. Bodhi Therapies — Kristi Erickson, PhD (founder and licensed clinical psychologist; U.S. Army). Unsatisfied with some institutional methods for treating anxiety-related issues that were neither effective nor efficient, Kristi developed a virtual reality program to help veterans suffering from PTSD and others. Kristi won the first-ever hackathon for women military veterans in a program run by VetsinTech in 2014 and continues to care for patients today. Thank You Universe — Scott Hepburn (U.S. Air Force). Scott is launching a company to organize the diverse and often confusing array of social benefits available to people in need, including homeless people on the street, targeted to their specific area. Financial Buddy — Nicodemus Moore (U.S. Army). Nicodemus was tired of untrustworthy financial firms preying on returning veterans and others with high interest rates and hidden fees, and came up with the idea to create a mobile app and website anyone can use to find reliable financing options and compare ideas with peers. 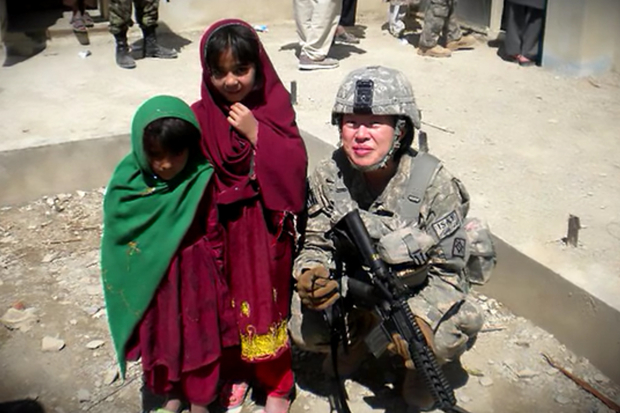 Pay It Forward — Ashleigh Titre (U.S. Army). Driven by a desire to make it easy for donors to give to their community and for people to receive food and hygiene items simply, Ashleigh came up with an idea to take the “pay it forward” concept to any grocery store or retail store that wants to support community giving. As these entrepreneurs grow, they’ll have good company in the executive office with other veterans leading large, public companies. Mark McLaughlin is the CEO of Palo Alto Networks and a U.S. Army veteran. FireEye is run by CEO Kevin Mandia, a U.S. Air Force veteran.